Bank treasurers need to comply with regulations and prepare to face more demanding corporate customers. London, 23 March 2016 – Managing liquidity is becoming a daunting task for banks as they are pulled from one side by their clients, which are in constant demand for better service and results over their deposited assets, and from the other by regulators that demand banks be resilient when under stressed conditions. Even if most banks are not effectively meeting those needs, are they undertaking initiatives to close the gap? 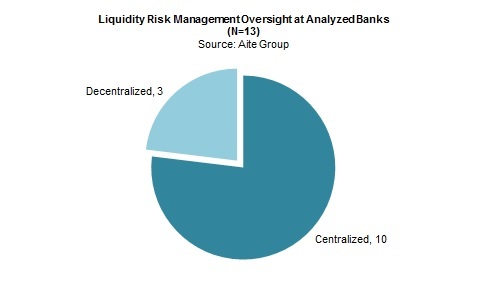 This report identifies the business imperatives that pressure banks to support their clients’ daily operations and the regulatory concerns that are influencing their organizational decisions as well as how they structure their portfolio offering to mitigate liquidity risk. It is based on Aite Group interviews with several bank and corporate executives and publicly available data references from top U.S. and European banks. This 38-page Impact Note contains 20 figures and one table. Clients of Aite Group’s Wholesale Banking & Payments service can download this report.